Musts in coastal home design. Help…I have to get my house ready for guests! Flowers are a must! I love to travel and see family but, I have to say the best part of traveling is coming home! I have house guests arriving tomorrow and so today is a cleaning, organizing and decorating day! It is humid here, and it is hard to make your house feel clean, so bringing fresh scents into your home will make it smell clean and add flowers to distract. Lilies as you know are very fragrant a little bit goes along way, so one or two will do it! I will also add herbs to my arrangements. 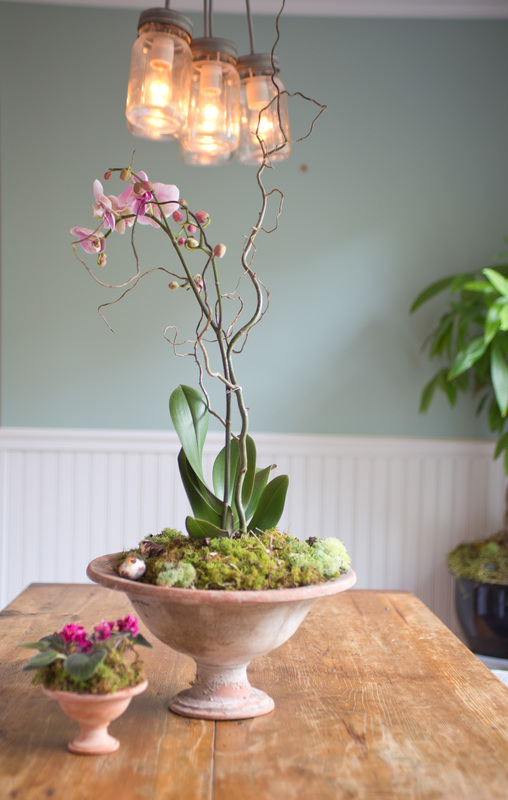 I am also making my go to floral arrangement, an orchid display. I love these because they require very little maintenance and they last for a couple of months. So the cost is relatively low when amortized over 2 months! A vessel for your display, a bowl, urn, or a soup tureen…here I have used a footed terracotta planter. An orchid, they come in amazing colors and shapes. These days you can get orchids anywhere. Trader Joes and even Walmart carry them for $10-$15, if I am splurging I will go to Skillins Greenhouse (207)781-3861 and get one of their $35 orchids. 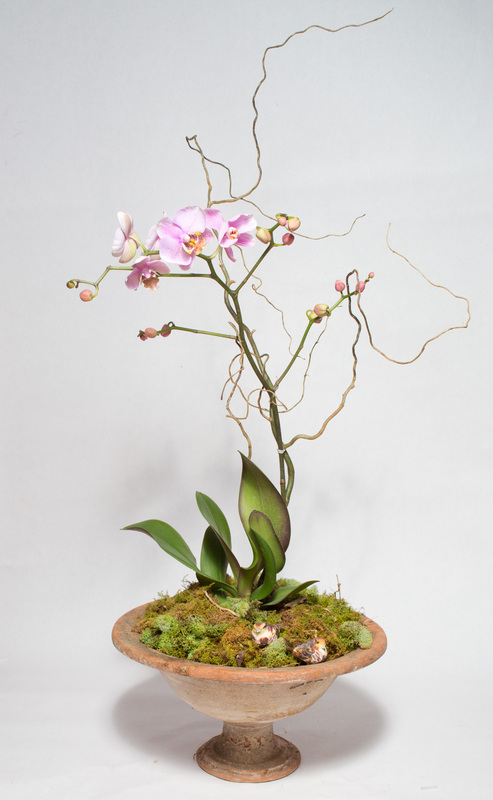 Skillins has really beautiful orchids that are much healthier, larger and they also re-bloom giving your flowers 2-3 times a year! Curly Willow (1-2 pieces) available at your local florist and even grocery stores. 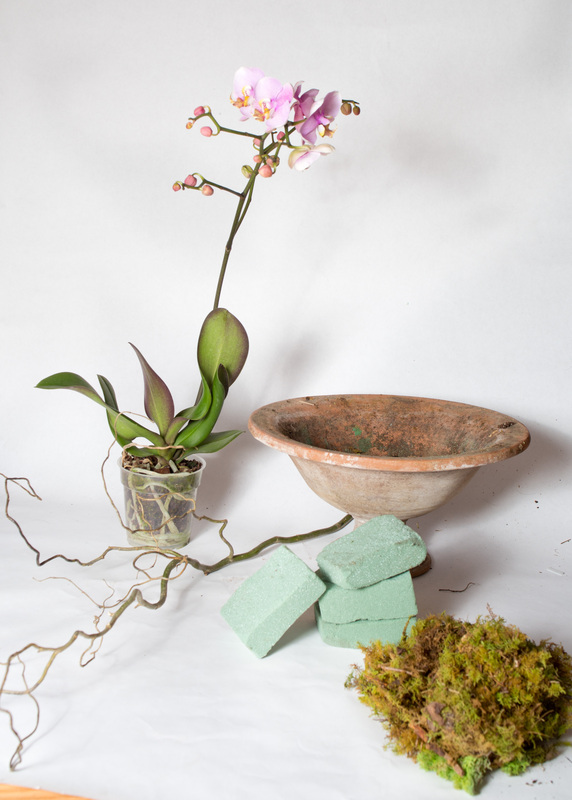 Step Two: Secure the orchid in your vessel with floral foam. This will keep your orchid from tipping over they are top heavy! Step Three: Remove the bamboo stick or metal post that comes with your orchid and replace it with a piece of Curly Willow. Secure it with twist ties in a few key spots! Step Four: Finish with Moss, cover the base of the plant and the floral foam with moss, I also cover the twist ties with moss! TIP: Water your orchid with 1-2 ice cubes a week. Please follow us (CLICK THE FOLLOW BUTTON), and never miss a post…without you we are nothing! If you have something to tell me please COMMENT on our post or blog!